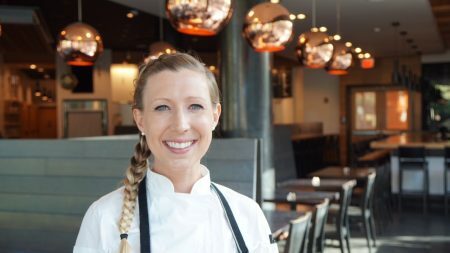 We recently got invited out to Black Sheep located in the Five Points area of Riverside to try their new pastry menu from new pastry Chef Rebecca Reed formerly of Matthew’s. 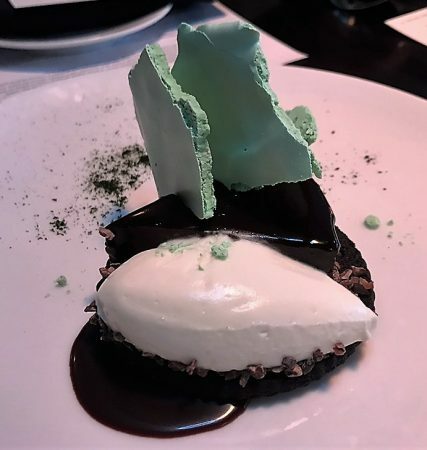 The first dessert we dove into was the Thick Mint Cookie Wedge(fudge sauce, Greek yogurt whip, cocoa nibs, mint powder). This definitely had the thin mint Girl Scout cookie sort of vibe. The texture of the Greek yogurt was thicker and a bit heavier than typical whip cream without having a heavy or overwhelming feel in your stomach. This dessert is something I think most people will enjoy whether they’re a chocolate lover or a cookie lover. It’s also much lighter than most chocolate desserts. Maybe the only small knock on it would be that the portion size feels a bit small. Sweet Corn Creme Brûlée was next. HOLY COW! This is the stuff dreams are made of!!! Just sweet enough with a hint of corn flavor, a taste of sweet cream, a taste of blueberry compote, a bit of whipped cream, and a taste of great caramel corn to top things off. It’s pretty much magic if you have a true sweet tooth. If you don’t love super sweet things you may not go as crazy as I did over this one but you’ll still probably enjoy it. 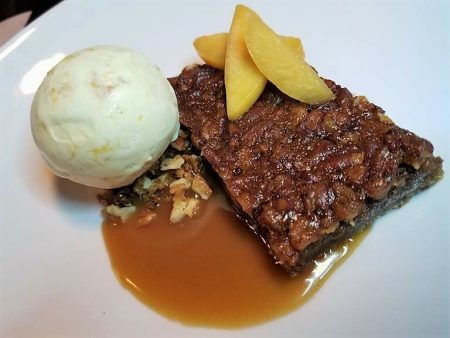 The next new dessert item we tried at Black Sheep was the Brown Butter Pecan Pie Slab(peach ice cream, bourbon caramel, pickled peach). This dish was deceptively rich. It didn’t look rich but it definitely was a bit heavier than the other dishes we tried so far. If you enjoy nutty desserts you’ll have fun with this one. If like us, you’re into pickled tastes you’ll really enjoy the contrast between the tartness of the pickled peaches and the richness of the bourbon caramel. 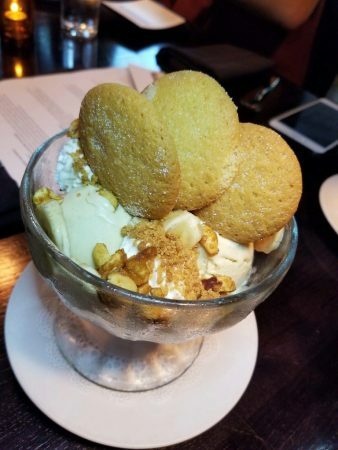 Next up was the Banana Pudding Fundae (nanner ice cream, candied peanuts, nilla wafers, toffee sauce). If they served us nothing but this banana ice cream we’d have been in hog heaven. As a die hard banana ice cream lover my standards for banana ice cream are stratospheric. With that said, this might be the best I’ve ever had. The dish as a whole was wonderful and gives you that childlike joy that whimsical desserts should. The last of the desserts we dove into was the S’more Pop (torched marshmallow, milk chocolate truffle, honey grahams). My biggest pet peeve with S’mores desserts is they so rarely taste like S’mores. 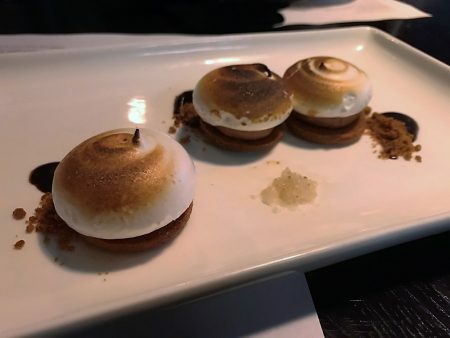 I give Chef Rebecca Reed credit in that this dish does actually have a S’mores taste and flavor profile. Beyond that I thought the dish wasn’t particularly memorable and reminded me most of a moon pie. All in all we walked away very impressed with the new dessert menu at Black Sheep. There’s an option for every palette. 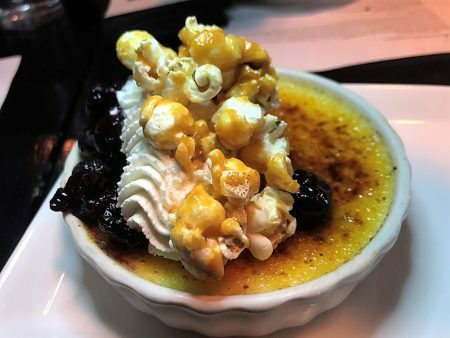 The sweet corn creme brûlée hits for the true sugar lovers. The brown butter pecan pie slab hits for those who love nutty desserts. The banana pudding hits for anyone who doesn’t hate bananas. Go try the new dessert menu! You’ll love it. Tagged Alcohol Serving, american, Dessert, Desserts/Ice Cream, Dinner, Full Bar, outdoor seating, romantic, Serves Alcohol, tapas, trendy. Bookmark the permalink.